Create a design and simulate using EE-Sim® tools: The MAX16834 is a current-mode high-brightness LED (HB LED) driver for boost, boost-buck, SEPIC, and high-side buck topologies. In addition to driving an n-channel power MOSFET switch controlled by the switching controller, it also drives an n-channel PWM dimming switch to achieve LED PWM dimming. The MAX16834 integrates all the building blocks necessary to implement a fixed-frequency HB LED driver with wide-range dimming control. The MAX16834 features constant-frequency peak current-mode control with programmable slope compensation to control the duty cycle of the PWM controller. A dimming driver designed to drive an external n-channel MOSFET in series with the LED string provides wide-range dimming control up to 20kHz. 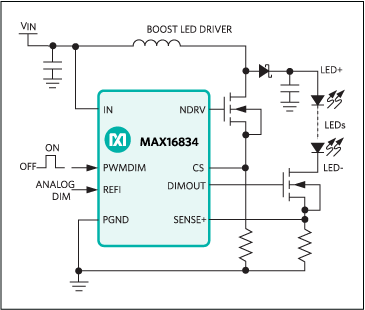 In addition to PWM dimming, the MAX16834 provides analog dimming using a DC input at REFI. The programmable switching frequency (100kHz to 1MHz) allows design optimization for efficiency and board space reduction. A single resistor from RT/SYNC to ground sets the switching frequency from 100kHz to 1MHz while an external clock signal at RT/SYNC disables the internal oscillator and allows the MAX16834 to synchronize to an external clock. 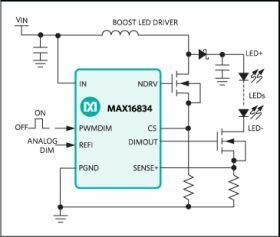 The MAX16834's integrated high-side current-sense amplifier eliminates the need for a separate high-side LED current-sense amplifier in boost-buck applications. The MAX16834 operates over a wide supply range of 4.75V to 28V and includes a 3A sink/source gate driver for driving a power MOSFET in high-power LED driver applications. It can also operate at input voltages greater than 28V in boost configuration with an external voltage clamp. The MAX16834 is also suitable for DC-DC converter applications such as boost or buck-boost. Additional features include external enable/disable input, an on-chip oscillator, fault indicator output (active-low FLT) for LED open/short or overtemperature conditions, and an overvoltage protection sense input (OVP+) for true overvoltage protection. The MAX16834 is available in a thermally enhanced 4mm x 4mm, 20-pin TQFN-EP package and in a thermally enhanced 20-pin TSSOP-EP package and is specified over the automotive -40°C to +125°C temperature range.